View More In Air Tool Parts & Accessories. 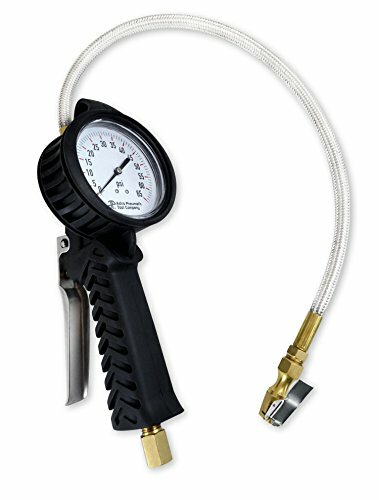 The Astro 3082 TPMS Dial Tire Inflator W/Stainless Hose - 0-65psi is constructed with a detailed high resolution dial face perfect for TPMS or any use where accurate readings are required. It is built for extreme accuracy with up to 260 percent more accurate than the ANSI standard, and includes a stainless braided hose (21") for maximum durability. The solid aluminum body is covered with a rubber sleeve for extra comfort and durability, and the 3 in 1 function allows the user to inflate, deflate and measure tire pressure. The tool has a two position inflate/deflate lever, and works with CO2 and Nitrogen. 3-1/8" (80mm) pressure gauge (2-65psi read). SPECIFICATIONS: Measuring Range: 0-65psi Units: PSI Resolution: 1psi Accuracy: +/- <1psi or +/- 1.5 percent Optimal Working Temp. : 32-104F. If you have any questions about this product by Astro Pneumatic Tool, contact us by completing and submitting the form below. If you are looking for a specif part number, please include it with your message.